The Bulls would defeat the Lakers in 4 games to 1. This would ultimately turn out to be Magic Johnson's last NBA Finals appearance, who was without James Worthy and Byron Scott, the Laker's #2 and #3 scorers, in the final game. Thus, the only win for the Lakers came in Game 1 when Sam Perkins (Michael Jordan's former University of North Carolina at Chapel Hill teammate) hit the game winning 3 point shot. Later in the final seconds, Jordan's chance for a game-winner rattled out. Other memorable moments came when Jordan shot 15 of 18 from the floor in Game 2 including a layup when, attempting to dunk, avoided a potential Sam Perkins block by switching hands in midair and laying the ball up with his left. The play became so popular that it would come to be known as "The Move" (in Chicago). Jordan also sent Game 3 (a game the Bulls eventually won) to overtime with a game tying jumper, a first of many such heroics for him on the NBA's greatest stage. 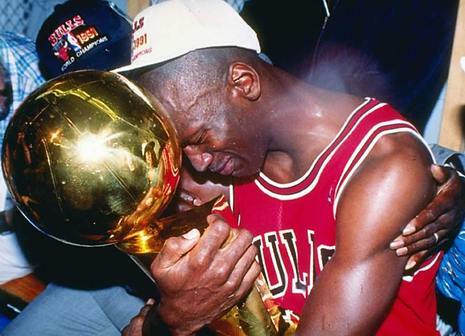 Michael Jordan unanimously won his first NBA Finals MVP award (to go with his regular season MVP award and his fifth straight scoring title), and wept while holding his first NBA Finals trophy.